Matthew and his family have just moved from Main Street to Finley Street. But Matthew doesn’t like his new home. He’d like to go back to his old neighborhood. But how? He’s too young to drive a car or take a bus by himself. And his mother wants him to get used to his new house. Then one day, he discovers The Wing Shop. 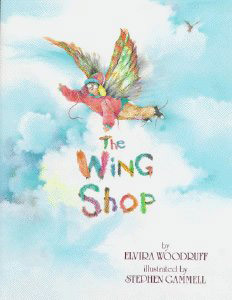 Swirling and flapping wings of every size, shape, and color hang from the wooden shelves. Maybe, thinks Matthew, a pair of wings could get him back to Main Street. How Matthew finally discovers that his new home is best – after three wild and wacky airborne adventures – ends this entertaining story.